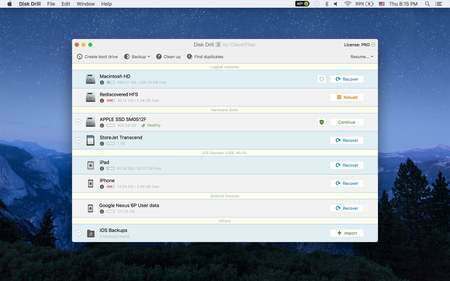 Disk Drill is the premium data recovery software for Mac OS X. It can recover lost data from virtually any storage device, including iPhones, iPads and Android. Disk Drill is packed with free disk tools like duplicate file finder, disk cleanup and space visualization, boot disk maker, byte-to-byte backups, disk health monitoring and more! Disk Drill can restore any file type on any file system. Mac OS X High Sierra (10.13) and Mojave (10.14), as well as APFS, Fusion Drives and Core Storage supported. Disk Drill is your all-in-one data management solution with the major focus on top-notch deleted file recovery algorithms. Whatever device you lost your data on, if you can connect it to a Mac, Disk Drill can scan it and has a good chance to recover deleted files. Even if you're having issues connecting to your system hard drive or external device, there's a possibility our data recovery software for Mac OS X can rescue your data. Disk Drill means recovery for all major file types and file systems. The available file recovery algorithms include Quick and Deep Scans, Lost Partition Search, several HFS+ Healing Algorithms and more. Our app is ready to rescue your documents, photos, videos, audio files, etc. Deep Scan knows more than 300 various custom file formats. Disk Drill also does hard drive recovery for RAID arrays, Core Storage and Fusion Drives - all in a minimal user-friendly interface. Moreover, if you install Disk Drill before any data gets lost, you can benefit from its free data protection features. There are two major modules offered by Disk Drill to prevent accidental data loss: Guaranteed Recovery invisibly makes copies of deleted files and folders you put in your Mac's Trash; Recovery Vault keeps records of all metadata for deleted files, so that they can quickly be recovered with their original names and locations. Disk Drill also cares about your disk health! S.M.A.R.T. and I/O disk-level errors monitoring warns you of any potential hard drive troubles.